I made this for my other sister's recent birthday. I meant to glitter up the cupcakes, but I forgot. I was making this just a few minutes before we were supposed to meet her for dinner, of course. I always forget about the spiral punch for cards and it's just wonderful! This card is perfect, and the coloring is especially good! So cute, Becky!! I have had this set for a little while and have yet to get it inky!!! Glitter or not, this is super cute!! Love it Becky! Beautiful coloring, colors and layout. Fab treatment for the sentiment! Fun card, Becky! I love the rhinestones and spiral punch! Hi Becky! Such cute colors and love the rhinestones that you added. Great idea with the spiral punch. I have that punch and haven't used it for so long. Love the cupcakes in the mailbox ....very cute!! I just love the color son this card! 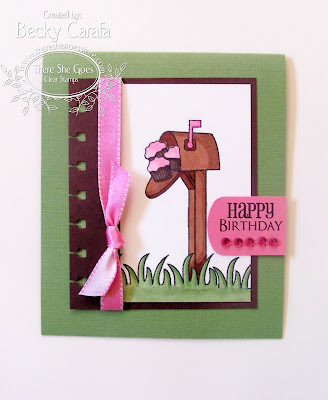 So springy and the image with the cupcakes coming out of the mailbox is just adorable!! A great card and I love the punching down the side. Hope you had fun at dinner!